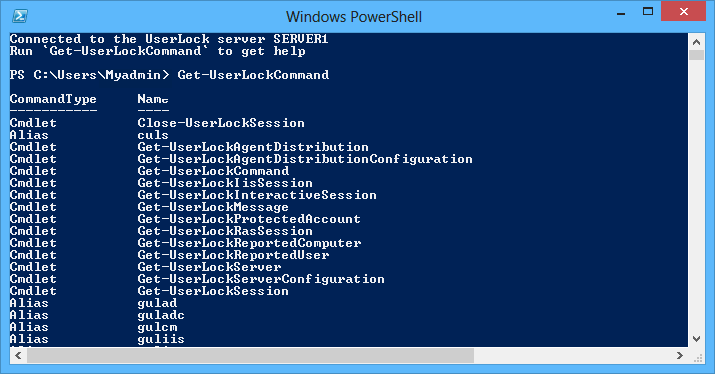 With the release of UserLock 7 comes PowerShell commands for Active Directory Security. Yes, it is now possible to manage/administer UserLock with PowerShell cmdlets! UserLock is an enterprise software solution that controls and restricts user access offering Identity and Access Management to Windows and Active Directory networks. Gaining in popularity and importance, Windows PowerShell is an extendable command shell and scripting language which can be used to manage/administer server environments like Windows Server, Exchange and also SharePoint 2010. Scripts can be written and scheduled at regular intervals enabling the automation of UserLock administration tasks. The UserLock cmdlets can also be used without a script to administer the UserLock server. The default option is “Restricted” which prohibits the execution of any PowerShell script. Note: There is no need to install anything else aside from the UserLock Console. Simply click on the icon PowerShell from the Toolbar located on the UserLock console. This launches a PowerShell console with the UserLock module that is loaded. 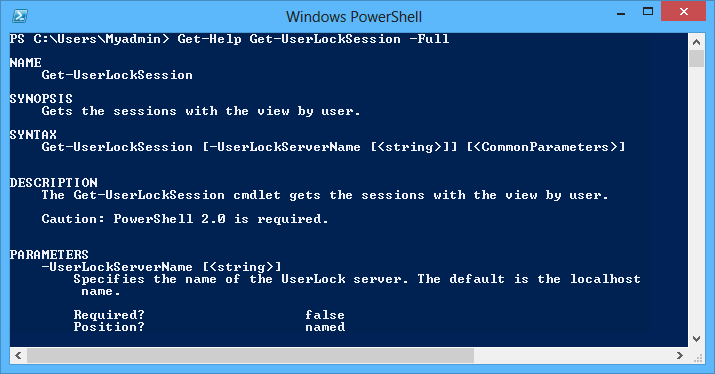 Once launched, UserLock PowerShell attempts to connect to the UserLock server selected in the console (if no server is selected, a connection will be attempted on the local computer). From this point, the first scripts can be written or the first UserLock cmdlets run. The “Get-UserLockCommand” command lists all the commands provided by the UserLock module. The following script (which could be named ‘Stop-UserLockWorkstationWithNoSession.ps1’) shuts down workstations that have no opened session during non business hours; useful in respect to ‘green’ IT policy. The next one (‘Install-UserLockAgentOnRemainingWorkstation.ps1’) installs the Desktop UserLock agent on workstations with no agent through the UserLock server. Useful if you have to reboot workstations to enable the UserLock agent (on OS XP, 2003 and older). This script can reboot overnight all workstations with a pending agent installation. This script can send a pop-up warning to all open sessions. This script enforces a UserLock setting (e.g. a welcome message) to all your protected users. You can also create protected accounts with specific criteria and rules that forbid them to use another workstation except the one you have attributed. You may also use UserLock cmdlets without launching PowerShell from the UserLock console. With the launch of UserLock 7, administrators that are proficient in and enjoy working with PowerShell now have the option to use this shell and scripting language when managing UserLock. Currently in beta, join our UserLock 7 Beta-Testing Program and see for yourself. To participate is very simple. Click on this link and you will find everything you need.